and Atol das Rocas, but now you can visit them from the comfort of your couch. Google Maps’ latest Street View imagery takes you through both UNESCO World Heritage Sites, widely considered to be amongst Brazil’s most coveted destinations. 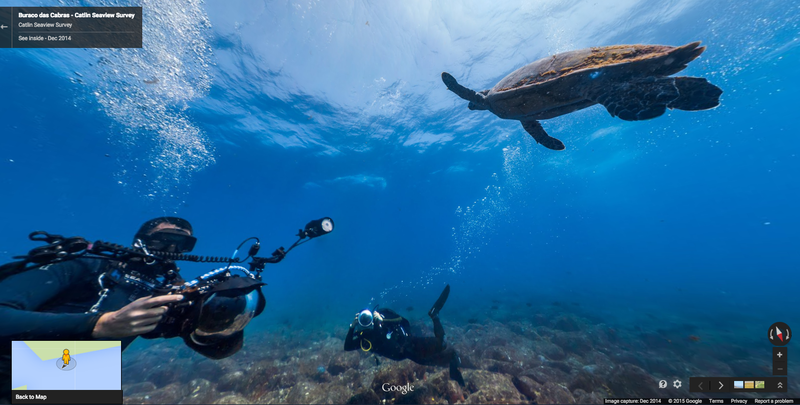 This Street View journey not only takes you across golden beaches and around towering cliffs, but also deep into the ocean for Brazil’s first underwater Street View collection. With help from the Googler Trekker, a backpack equipped with a 15-lens camera, and our partners at Catlin Seaview Survey, these images offer an immersive picture of two areas Brazil is striving to preserve. Our first stop is Fernando de Noronha, a group of islands known for their natural beauty and ecotourism, and a prized destination in Brazil. Tourists, only permitted on the island in limited groups due to conservation efforts, often seek out the archipelago’s stunning beaches. A trip to Fernando de Noronha may begin with a stop at Cacimba do Padre. This beautiful beach is known worldwide for its incredible surfing and gorgeous sunsets. If the sand isn’t for you, make your way toward Baía dos Porcos. This small stretch of land is known for its spectacular views of “Dois Irmãos,” two grand rock formations triumphantly rising from the ocean. 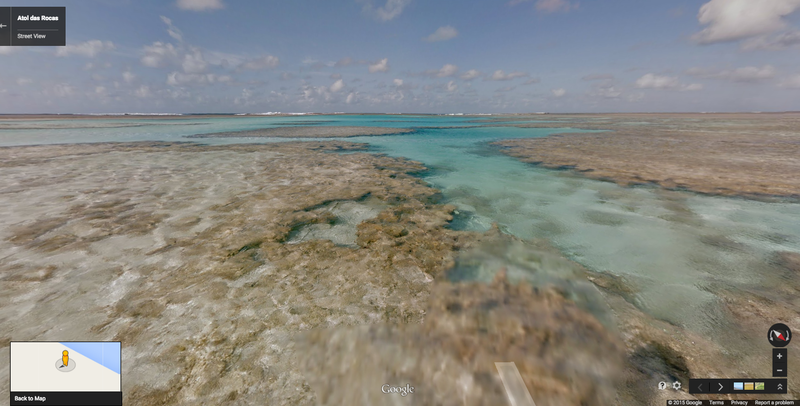 Our next stop is Atol das Rocas, an atoll in the South Atlantic ocean used exclusively for scientific research. A pivotal breeding area for various animals, Atol das Rocas is home to 30 species of tropical seabirds. While you won’t be able to come here as a tourist, virtual visits are highly encouraged! Ready for a swim? Dive into the Atlantic Ocean from the top of Buraco do Inferno. 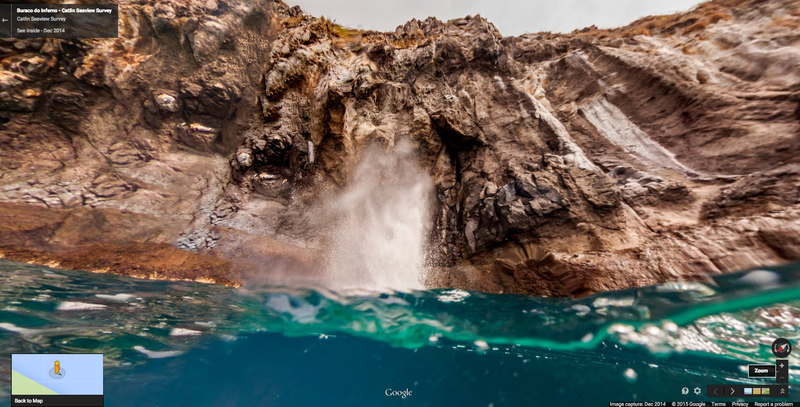 Also known as "The Devil’s Hole," this huge rock formation is a popular diving spot in Fernando de Noronha. At certain points in the day, its blow hole releases air and water in an eruptive display. Fernando de Noronha and Atol das Rocas are also sanctuaries for animals and marine wildlife precious to the regions, including dolphins, turtles, and a variety of fish. Schools of fish often traverse volcanic rock beneath the ocean’s surface at Trinta Reis. These dolphins, known as “spinner dolphins” due to their acrobatic modes of swimming, are making their way through shallow waters. Alongside divers snapping pictures, you can swim with a large sea turtle moving with the ocean’s current. 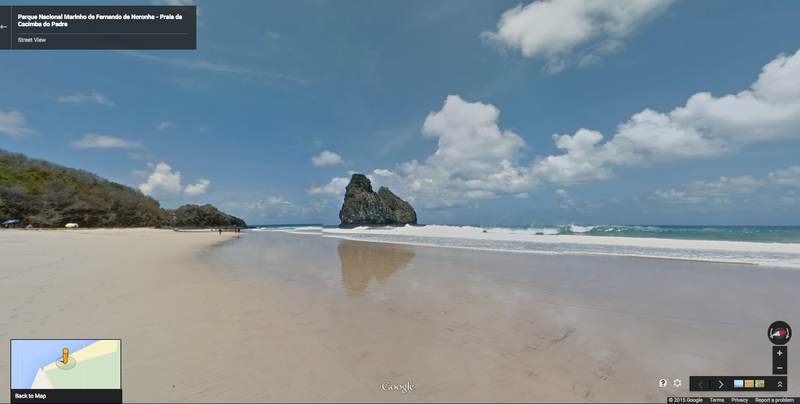 To bring more island beaches to your living room, or continue your virtual scuba-dive, visit Fernando de Noronha and Atol das Rocas on Street View, or check out our gallery of highlights! 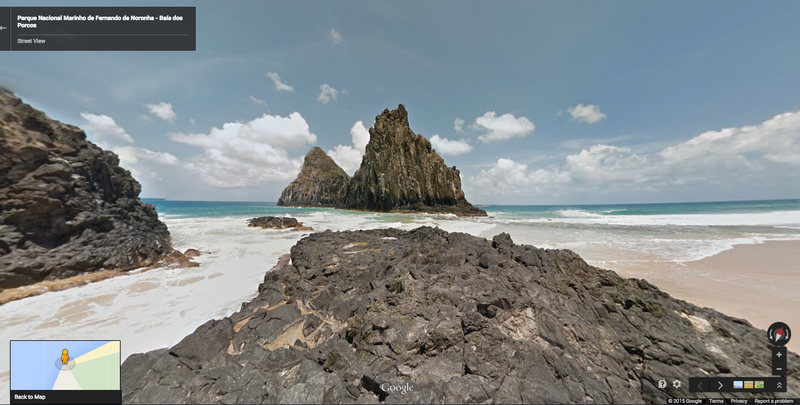 Few people have set foot on the islands of Fernando de Noronha and Atol das Rocas, but now you can visit them from the comfort of your couch. 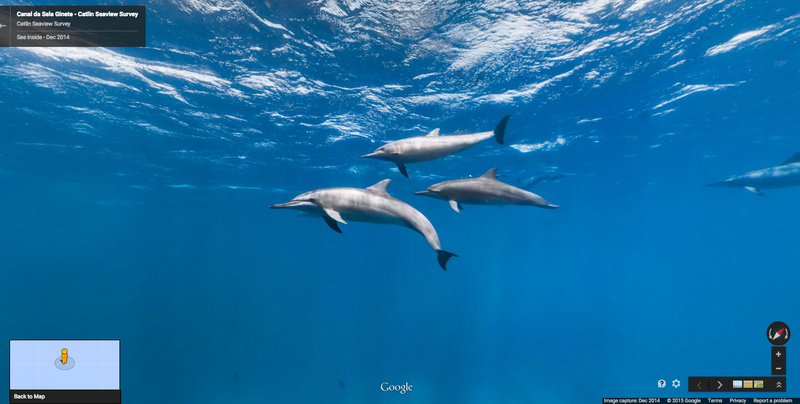 Google Maps’ latest Street View imagery takes you through both UNESCO World Heritage Sites, widely considered to be amongst Brazil’s most coveted destinations. 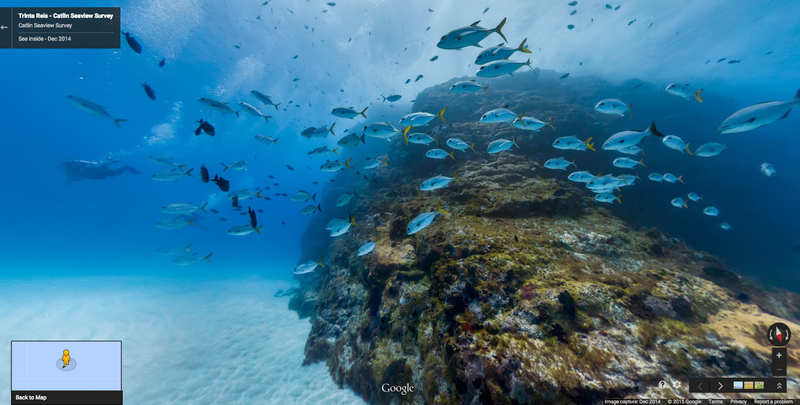 This Street View journey not only takes you across golden beaches and around towering cliffs, but also deep into the ocean for Brazil’s first underwater Street View collection. With help from the Googler Trekker, a backpack equipped with a 15-lens camera, and our partners at Catlin Seaview Survey, these images offer an immersive picture of two areas Brazil is striving to preserve.